Because the left and right hoses are not interchangeable, verify the part number when installing the flexible hoses. If the hoses are to be reused, connect them after checking the identification marks placed when each hose was disconnected. 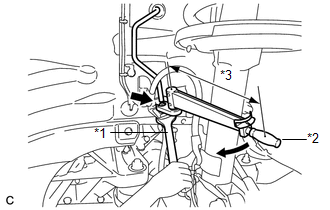 (a) Connect the front flexible hose to the disc brake cylinder assembly with a new union bolt and a new gasket. (b) Install the front flexible hose with a new clip. Install the clip as far as it will go. 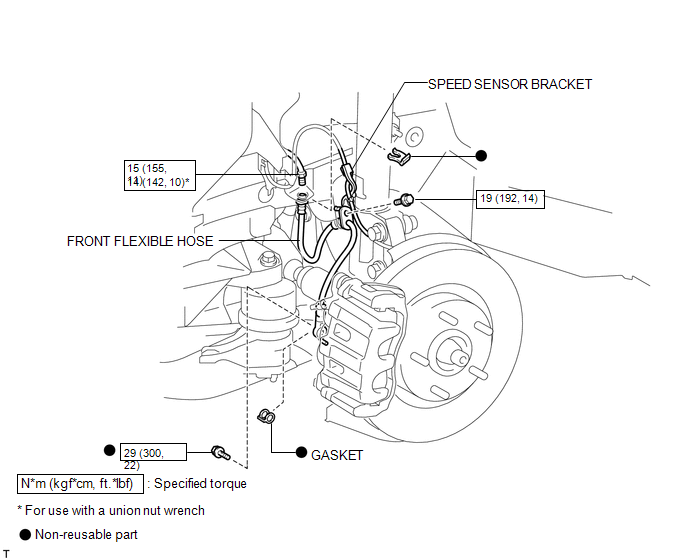 (c) Using a union nut wrench, connect the brake line to the front flexible hose while holding the front flexible hose with a wrench. Do not kink or damage the brake line. 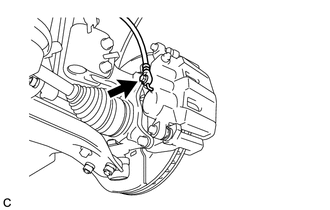 Do not allow brake line to twist and interfere with other parts or body during flexible hose tightening. (d) Install the front flexible hose together with the speed sensor bracket to the absorber bracket with the bolt. If both the left and right side hoses are removed at the same time, be sure to place identification marks indicating the position on each side. 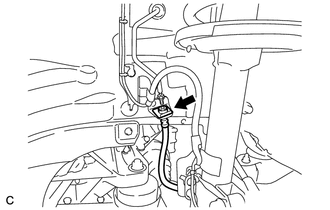 (a) Remove the union bolt and gasket, and separate the front flexible hose. 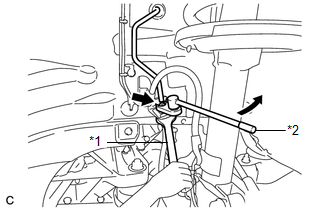 (b) Using a union nut wrench, disconnect the brake line from the front flexible hose while holding the front flexible hose with a wrench. 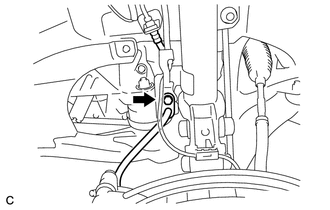 (d) Remove the bolt and front flexible hose from the absorber bracket.